Evan Cameron was a very good all round distance runner. When he started running well at a national level, it was a bit of a surprise to many of us in the West of Scotland as he had seldom raced in that neck of the woods. It was not long before he was well known though and his career as an athlete is recorded below by his friend and rival Colin Youngson. Evan Cameron was a versatile cross-country and marathon runner who trained exceptionally hard and made an impact on Scottish Athletics between 1977 and 1986, when he emigrated to Canada. He was educated in Musselburgh and started running at Durham University in 1976. 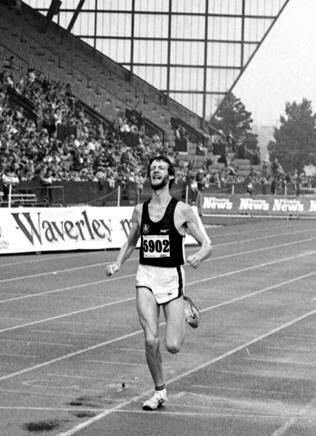 After his course finished in 1977 he ‘retired’ from athletics; but only a few weeks later found himself accepting a challenge while inebriated – to run the Scottish Marathon Championship wearing someone else’s number. His preparation lasted six days: ten miles for three days; and two miles for the last three! After the inevitable struggle he finished in 2.53, not bad considering. That autumn he moved to Edinburgh to start work. Living in Marchmont he used to run round the Meadows three times a week. One evening he was chased by a runner (Colin Youngson) from Edinburgh Southern Harriers, who found it hard to catch up. Evan’s talent was obvious and he was invited to join the Sunday Balerno 16 mile training run. After suffering a few tough sessions, Evan gained fitness, joined ESH and started his steady improvement to International status. By 1978 he had finished third in the demanding Edinburgh University 10, twice round the Braid Hills circuit. Mind you, he managed to beat Donald Macgregor amongst others because there was a thick carpet of snow and Evan had the wisdom to wear spikes for this particular road race! Before long it became clear that Evan’s defining characteristic as a runner was his enormous appetite for long, hard, fast training runs. Even Sandy Keith enjoyed an easier session now and again. By 1980, Evan could run 120 miles per week for two consecutive months. This meant: Sundays 20 miles in the morning plus 4 miles extra in the evening; Mondays 8 miles to work and 12 home; Tuesdays 8 miles to work and another 8 home; Wednesdays 8 to work and in the evening 7 miles, including 8 fast 400s on grass; Thursdays 8 miles to and 10 miles from; Fridays 8 to and 4 from; Saturdays 15 miles, often including a race. Evan admits now that he might just have overdone it a little, and not tapered enough for races, but in general this exhausting schedule worked well for him. From 1979 to 1985, Evan’s day started with what was very nearly a race – a very rapid 8 mile morning run with that other great trainer, Sandy Keith. Evan writes: “These runs were always conducted running side-by-side, neither one of us conceding an inch to each other. Sandy became a mentor to me, offering advice on race tactics and on the need to introduce speed and hill sessions into what had previously been a regime of one-paced runs. Our morning efforts really helped me to build towards weekly targets – provided that I rested physically while at my desk job during the day.” Since both Sandy and Evan faded from the running scene before the late 1980s, some might say that they trained a little too hard – but both certainly enjoyed successful careers at the top before the workload became too much. In the Edinburgh to Glasgow Relay, Evan won three medals with ESH. In 1979, when he ran Stage Four, his team finished third. They could only manage fourth in 1980, but Evan had been promoted to the longest Stage Six. 1981 produced a double triumph: not only did ESH strike gold, but also Evan Cameron was fastest on Stage Six, beating amongst others John Graham, Graham Laing and Lindsay Robertson. 1982 saw another ESH victory, with Evan holding on to second place, once more on Six. Southern were less successful (6th) in 1983, despite Evan’s fastest time on Stage Five. Then in 1984 they ended up 6th once more, with Evan holding on to second place on Six, before the last two runners slipped back. More evidence of Evan Cameron’s prowess as a road runner was provided by his record in the National Six-Stage Relay. ESH had an early monopoly in this event and Evan always contributed well by running the fourth (long) stage. He won team gold in 1980, 1981, 1982 and 1983, before winning silver in 1985. 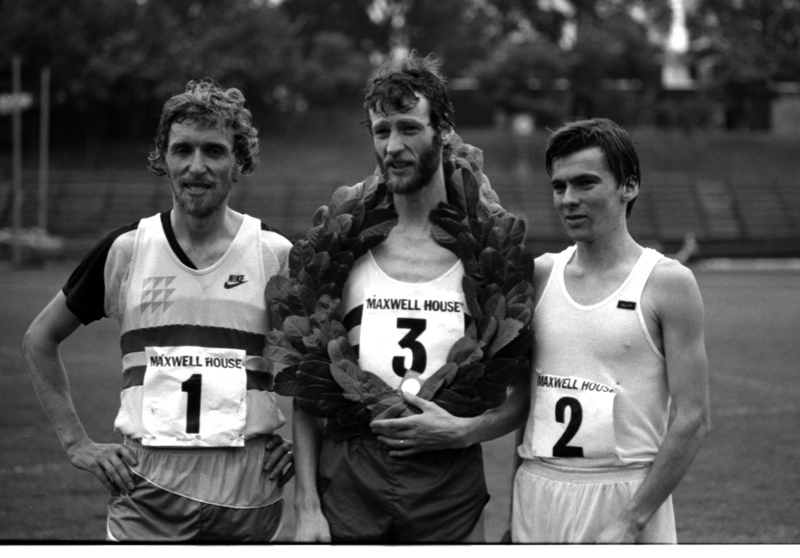 The Scottish Cross-Country Relay was a little short for Evan, but in 1981, along with Colin Hume, Allister Hutton and Ian Elliot, he was part of a winning ESH team. In the National CC, Evan had a very consistent record over seven successive races, improving from 1980 to his peak in 1983 and then slowing a little before his swansong in 1986. His finishing places were: 28, 22, 14, 9, 15, 19 and 24. ESH won gold in 1980, 1982, 1983, 1984, 1985 and 1986, and silver in 1981. 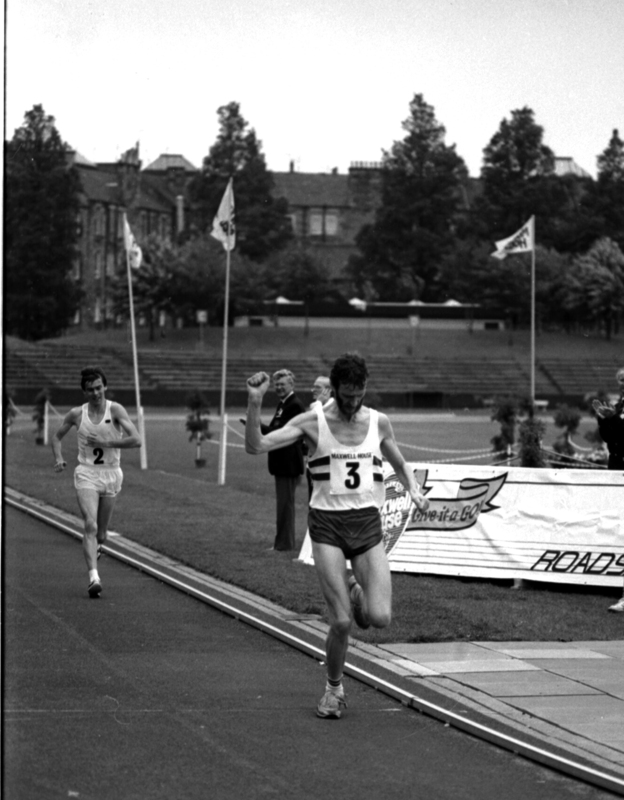 Evan’s best run was undoubtedly in 1983, when he led his team to victory on a hilly, slippery, muddy course at the Jack Kane Centre in Edinburgh. He ended up ninth, in front of stalwarts like Graham Laing, Eddie Stewart, Paul Kenney, Graham Clark, Charlie Haskett, Cammie Spence, Brian Kirkwood, Rod Stone, Andy Daly, Craig Hunter, Ross Copestake, Adrian Weatherhead and Dave Logue. Evan was justifiably proud of his selection to run for Scotland in the IAAF World CC Championships. This took place over the vicious undulations of Gateshead’s Riverside Bowl. Although Evan found it very hard, he did manage to beat George Braidwood, who had been second in Edinburgh. In the E to G, 6-Stage Relay, CC Relay and the National CC, Evan Cameron won a very impressive total of thirteen team gold medals, two silver and one bronze. His consistently intensive training might suggest that Evan Cameron would be a ‘natural’ to succeed in the marathon but, possibly because he did not ease up before races, and over-cautious tactics, his progress was gradual. In the 1979 Aberdeen Marathon, Evan finished 7th in 2.31.22, a decent time on a tough course. He ran for Scotland in the Home International at Aberdeen in 1980 (9th in 2.30.13) and 1981 (7th in 2.26.23). In the latter year, he also ran strongly in an international marathon in Holland and finished fifth in the Scottish Championship (2.27.23). At the Commonwealth Games trial in June 1982 at Gateshead, over a hard, hilly route, Evan did well to produce a PB of 2.22.00. He reduced this to 2.20.33 at London 1983. Over a nasty course in the Scottish Marathon in 1984, he won a bronze medal in 2.29.30. Then came a breakthrough at that year’s Edinburgh Waverley Marathon, when Evan was second to Lindsay Robertson in 2.19.34. 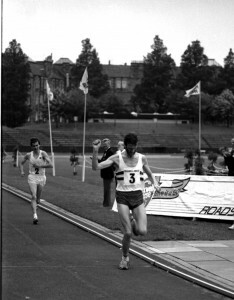 Evan Cameron lined up for the 1985 Scottish Marathon with confidence. Sadly, this was to be the last time that the marathon was part of the Track and Field Championships. 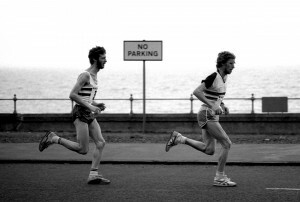 The leading group ran away briskly from Edinburgh’s Meadowbank Stadium, down to Portobello into a strong headwind. A group of four went clear: Evan Cameron (ESH), Colin Youngson (Aberdeen AAC), Graham Getty (Bellahouston) and Pat McErlean (Aberdeen AAC). Indeed it was Pat, a 2.23 man who trained in Aberdeenshire with Youngson, who did most of the leading through three miles (15.52), although he had been dropped by seven seconds by five miles (26.29) and eventually slipped away. Even sharing the headwind and coping with a series of small hills was tiring. Ten miles was passed in 53.54 and by eleven miles Graham Getty was off the pace. The turn was reached in 70.53, and with the wind behind, the pace increased to 5.10 miling. Youngson hung on as best he could to Cameron’s determined running, but although Evan’s best was 2.19.34 and Colin had managed 2.19.22 in a Dutch race in April, on this occasion the younger man was superior. After sixteen miles, Cameron ran a five minute mile and opened up an increasing gap on Youngson. The leader passed 20 miles in 1.47.13, thirty seconds clear. After 22 miles, both suffered fatigue, and it was Getty who began to close slightly. At the finish, Evan Cameron was delighted to win his first individual Scottish title in 2.22.49, with Colin Youngson collecting his tenth and last Scottish marathon medal in 2.23.46 and Graham Getty winning bronze in 2.24.13. Fourth was E. Walker (Livingstone and District) in 2.31.26. Each competitor received a jar of instant coffee! The pictures below tell the story of the race: Leading group of four at five miles, Cameron and Youngson at 13 miles, then there was one – Evan finishing first, and the first three: Youngson, Cameron and Getty. In 1986, Evan Cameron emigrated to Canada to raise a family, develop a busy and successful career, and very occasionally go out for a five mile jog, to prove that he could still actually run. He has every reason to be satisfied with a fine competitive record as a distance runner.